Orthodontic treatment creates beautiful smiles and increases confidence. Overbites typically cannot be corrected with simple braces. 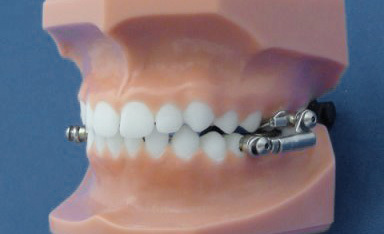 But, in conjunction with braces, The Herbst appliance helps the lower jaw develop in a forward direction. This leads to an ideal bite. Left untreated, an improper bite may threaten the long-term health of your child’s teeth, gums, and jaw. A Herbst appliance is fixed to your child’s molars and consists of a metal tube that connects the upper and lower jaw. Ries Orthodontics is able to control the jaw’s position in relation to the upper teeth by adjusting the tube. Treatment typically lasts 12 months. A Herbst appliance is securely fastened to your child’s teeth, while headgear is removable. Headgear should be worn for at least 12 hours per day to be truly effective, which often poses a problem with patients who don’t like to keep it on that long. Since the Herbst appliance is not removable, you won’t need to keep track of how many hours per day your child wears it. Headgear is made of metal hooks or a facebow, and straps to a head cap to anchor the headgear to the back of the head or neck. A Herbst appliance is much more discreet. It may be visible when your child laughs or speaks, but it is far less obtrusive than headgear. In the first week or so, there may be some overall muscle tenderness and soreness of the teeth as your child’s mouth adapts to the Herbst appliance. Still, the soreness should fade. Because the Herbst appliance is metal, it may cause slight irritation, especially on the lower gums. It will take time for your child’s mouth to adapt. Until it does, dental wax can help to ease the irritation. During the first week or two after getting the appliance, eating softer food will help with any muscle soreness. It is also important to eliminate sticky foods, like candy and gum, or hard, crunchy food.